Born in Hammersfist, during the aurora borealis, the six-foot tall and toned beauty with long fiery red hair and eyes of purest blue hails from a remote northern land. The future pre-set as sure as there were constellations in the heavens. It was only right. Many hours had been spent upon the water, as well as gazing out over it. Many hours on the cliffs, far above the fjords, where fate spoke to her that night so long ago. The rolling of the waves is something that always has been and always shall be, and that is the way of life. Just as the warrior's way was her way ... her destiny. Known from the beginning, the warrior's path was an extremely difficult one. No other female from her clan had undertaken the task once they had been told to be accepted into training they must become better than the males -- fight better, walk further distances, carry more than the normal weight of items, and learn all the ways of sailing, including navigation and the longboats. Undaunted, her perseverence brought reward when acceptance into the warrior's circle was finally gained. Trained under the keen, watchful eyes of long-time friend and mentor, Stigvard, son of the great Viking Ivarns, she became an adept seafarer and fighter; following in the footsteps of her nine older brothers, much to the dismay of her mother and father. Having participated in a large number of battles throughout the far, rugged Northlands the female warrior achieved a deservedly-well, but hard-earned reputation. Bears visible scars reminding her of near fatal errors, refusing to have them removed by magical means; a long, narrow one above the left eyebrow disappears into her hairline directly above the left ear while another runs the length of her face intersecting the first at the left temple. Upon viewing her right forearm one will see several severe-looking claw marks. Many more battle scars lay hidden beneath her clothing. Shy's attire usually consists of tanned reindeer breeks, a sleeveless white blouse, furry knee-high boots, bracers, fingerless gloves of leather, and a hooded cloak; one of arctic fox and wolf pelts during the colder month's. Noticeable, too, is the etched silver band of Hammersfist's warrior tribe encircling her upper left arm. Three small rings adorn the same ear: One gold, two silver; silver giving her the ability to 'Shadow Step' as well as being the most prized of metallic elements. Gracing her neck is a Tors Hammer amulet, a gift from a friend. Carries a longsword, Fire'n Ice, on her back, a whip, The Tearmaker, at her side, and two concealed blades; one with runic markings, the other being the Stiletto of Bloodclaw, given to her by one most dear to her heart. After receiving word from her youngest brother, Bjørn, she set sail with a warrior crew to visit a strange land and its many unusual inhabitants; deciding to build a cabin near one of the pristine lakes located between the forest and the mountains. The name of 'Shylah' was adopted, as suggested by Bjørn, in order to keep her identity hidden. Shylah's true name is known by all those in Hammersfist and it is rumored that some type of connection to Idun is held, although that has never been substantiated. Life in the new land had taken many twists and turns, and the warrior learned to steel herself against the chaotic ways of such a bizarre place; using the knowledge gained to her own benefit. Venturing to other realms, such as the now-destroyed Sommerhaven, Shy continues to seek out others, learning new and interesting trades, taking part in battles against orcs, and enjoying life to the fullest. One can often find her laughing, jesting, and/or sharing a good drink, tale or poem at one of the local taverns or inns; amused that many can be lulled into complacency and forget about that fierce Viking nature. Please join in and see the lands, people, and creatures met. She will surely enjoy your company, traverse these portals often, and find new ones to investigate. Perhaps you would like to hear poems or stories. She has much to tell! the tasks set before them go on to greatness. Jiminy and I take pleasure in displaying this reward, 'twas indeed a mighty challenge. If you wish to visit Castle Quest, simply touch the shield! 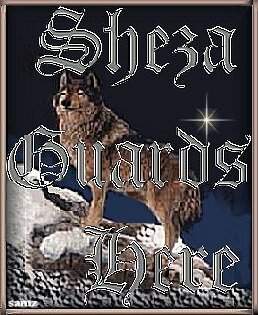 This be Sheza, one of my wolves. The wolf be powerful, fierce, and honorable. Shylah Vulpecula, Warrior from the Land of the Midnight Sun, Stigvard, and Ivarns are fictional characters and the intellectual property of this site's creator and designer. Any resemblance to actual people is completely coincidental. These characters *and/or any* content within and pertaining to this site and its pages, may not be used without explicit, written authorization. Please be assured that any information is *not* to be used for commercial purposes. et nunc et semper, et in saecula saeculorum.